I know, I know…all of you are kind of shocked by those strange eating schedules when you come to visit us: we do have breakfast at standard hours, just like you, but lunch is rarely before 13:30 (01:30PM), and it´s quite complicated to find a restaurant open before 21:30 (09:30PM), except maybe in Donostia-San Sebastián, where they are more influenced by the French visitors. Kids have an extra meal right after school, between 17:00 to 18:00 (just a sandwich, a piece of fruit and/or a yoghourt). On weekends this schedule readapts to our way of life: breakfast, as everywhere else, is later. But then we have the “aperitivo”, which is around 13:00, and may consist of several glasses of wine or “zuritos” (small glasses of beer), together with some pintxos, friends and outside the bars, if the weather is nice. We then have lunch (yes! ), around 15:00, which may last a couple of hours. And then, the siesta…(which is not as common as you may think). Dinner on a Saturday evening may not start before 22:00 (10:00 PM) and not finish before one in the morning…or later. And it´s very hard to get a table before 0930PM. Another habit of ours is to have the “amaiketako” (meaning at eleven), that is, a small meal by 11AM or so, in order to keep going until lunch time. It used to be more popular in the past, when factory or rural labour had long working hours and work was much tougher than today. That´s why our working and school times divide our day into two long sections. And the main news on TV are at 3PM and 9PM, finishing almost at 10PM. So don´t be surprised if you feel like having dinner at around 6PM and find that people are still working and restaurants closed. 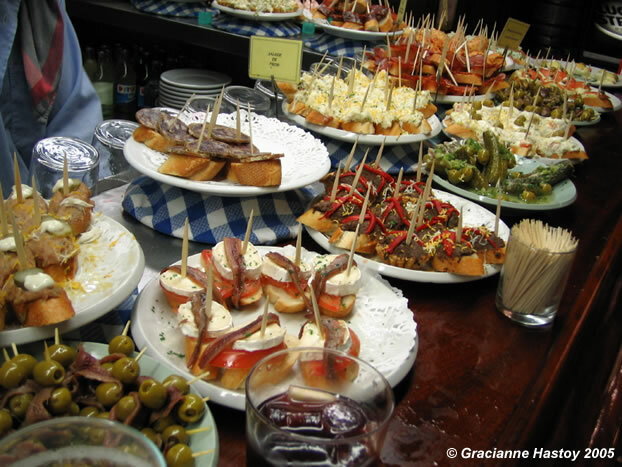 Relax, have a glass of wine and a pintxo and blend in with the locals, it´s a wonderful experience!!. This entry was posted in Basque, Culture, Food, Restaurants, Schedules and tagged Amaiketako, Food, Lunch, Schedules on April 12, 2010 by Leire Gaceo.